Sawyer’s Aluminum Alignment Clamp offers ultimate welder convenience by using a two-piece design that is easy to use and cost efficient. Easily achieve full 360-degree welding with this lightweight and portable external line up clamp. Constructed of high-strength cast aluminum alloy, this pipeline welding clamp is precision bored to ensure accurate alignment and pipe-to-pipe fit up. 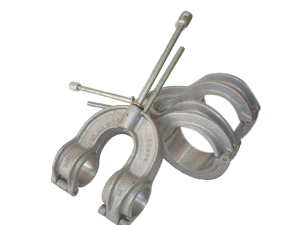 The Aluminum Alignment Clamp is available in 3/4” through 6” sizes, and sizes are also available for special tubing. This aluminum line up clamp represents superior speed, accuracy and ease of use when compared with other pipeline welding clamp options. One person can position the clamp and start welding in about two minutes for most applications and pipe sizes. Not many aluminum line up clamps can claim that type of simple usage while maintaining excellent accuracy and durability. These alignment clamps are popular with pipe fitters and welders because of their lightweight and portable design and their simple pipe-to-pipe fit up possibilities. They are also frequently used by farmers and ranchers in pipe fence construction and repair. All those satisfied pipe clamp users can’t be wrong. The Aluminum Alignment Clamp is just a great, versatile line up clamp. Simple, easy to use and accurate. These are the qualities of Sawyer’s entire product line and why the Aluminum Alignment Clamp is the ideal choice.